Here’s a great interview with inequality scholar Branko Milanovic wherein he brings a much-needed historical and international perspective to the debate (h/t: C. Marr). Many of Branko’s points are familiar to my readers: yes, increased trade has upsides, for both advanced and emerging economies. But it’s not hard to find significant swaths hurt by globalization, particularly workers in rich economies who’ve been placed into competition with those in poorer countries. The fact that little has been done to help them is one reason for president-elect Trump. The problems with globalization arise from the fact that gains from it are not (and can never be) evenly distributed. There would be always those who gain less than some others, or those who lose even in absolute terms. But to whom can they “appeal” for redress? Only to their national governments because this is how the world is politically organized. Thus national governments have to engage in “mop up” operations to fix the negative effects of globalization. And this they have not done well, led as they were by the belief that the trickle-down economics will take care of it. We know it did not. But I’d like to focus on a related point from Branko’s interview, one that gets less attention: the question of whether it was really exposure to global trade or to labor-saving technology that is most responsible for displacing workers. What’s the real problem here: is it the trade deficit or the robots? Branko cogently argues that “both technological change and economic polices responded to globalization. The nature of recent technological progress would have been different if you could not employ labor 10,000 miles away from your home base.” Their interaction makes their relative contributions hard to pull apart. I’d argue that the rise of trade with China, from the 1990s to the 2007 crash, played a significant role in moving US manufacturing employment from its steady average of around 17 million factory jobs from around 1970 to 2000, to an average today that’s about 5 million less (see figure below; of course, manufacturing employment was falling as a share of total jobs over this entire period). 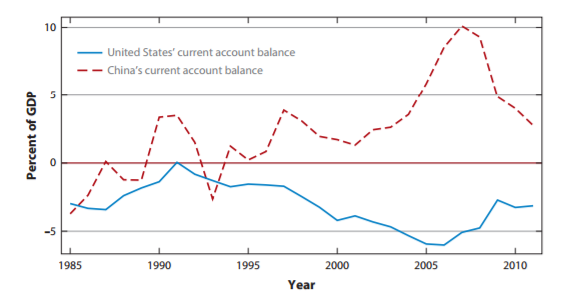 The relative trade balances, shown in the next figure, underscore this point, as China’s surplus grew sharply in the 2000s while the deterioration of our trade deficit accelerated (source: Autor et al; I’ll discuss the reversal of these trends below). Finally, the “robots did it!” story requires an acceleration in productivity growth. The next figure shows manufacturing productivity growth (yr/yr) since 1987 (also, read Sue Houseman’s very important work for the full story here). It’s awfully jumpy, so I’ve plotted a 5-yr rolling average. There’s a bit of acceleration in the 1990s or 2000s, and I’m not denying automation has played a role in the pattern in the employment figure above. 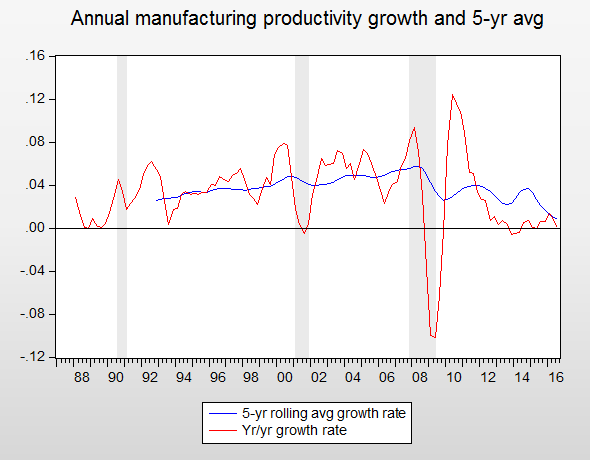 But it’s unlikely to be the whole story and that story is particularly strained today, as manufacturing productivity growth has crashed in recent years. But my main point here is that it’s a mistake to either believe that trade and technology are clearly separable forces, or to think that it matters to workers which force is displacing them. Too often, policy makers seem to assert that, because “it’s not trade, it’s technology!”—typically offered without much evidence—displaced workers should somehow be assuaged. Hey, all they need to do is go from running a drill press to designing, building and programming drill-press-running robots! True, trade and China are much more tangible targets, and I get that they sometimes carry more symbolic weight than they should. That’s particularly true regarding China right now, which is trade enemy #1 in the Trump playbook, despite the fact that their trade surplus has been falling and, if anything, they appear to be trying to prop up the value of their currency (the trade play is to depreciate). But remember, automation and labor-saving technology are ongoing forces that have been with us forever. Historically, increased demand for the extra output created by faster productivity growth absorbed displaced workers, sometimes in new sectors. All of the above distribute income upward, and not just income, but just as importantly, power and the political influence that makes reversing these false assumptions an extremely heavy lift. The system effectively insulates itself from progressive change. I don’t have the answer to the question of what breaks this extremely damaging chain, but I’m sure it involves some serious organizing of the many hurt by this dominant agenda against the minority helped by it. At any rate, a good place to start is a clear-eyed identification of the problem. Share the post "Inequality, technology, globalization, and the false assumptions that sustain current inequities"
12 comments in reply to "Inequality, technology, globalization, and the false assumptions that sustain current inequities"
Actually, automation has knocked the growth rate in manufacturing employment down since the great depression. Your missing that point. 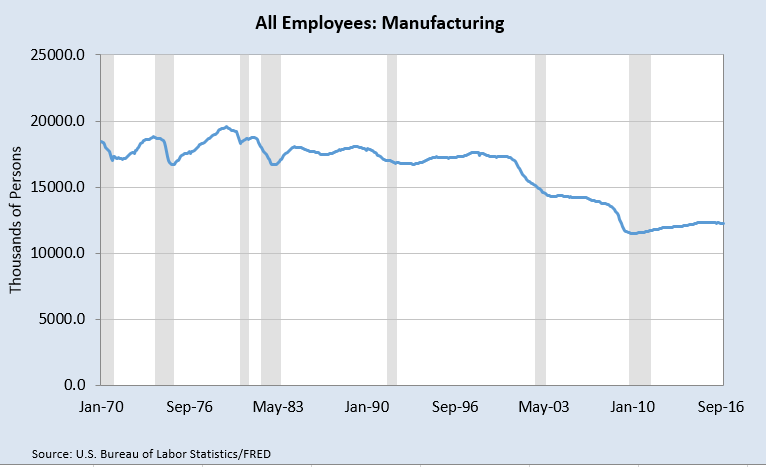 It is only recently that manufacturing productivity has dropped. You identify some proximate false assumptions but don’t include the ultimate false assumption, perpetuated by mainstream economics, namely that capital (money) is scarce – it isn’t. Think about it. The productivity data is noisy due to BIG recession. Demand plummeted, drop in output lags until inventories rise, followed by drop in output. Business tries to hold more trained workers than need in hope that the recovery will soon require those workers. This way they can avoid the costs of retraining, hiring etc. Productivity plummets from more workers than necessary. Once output recovers, productivity shoots up, as demand and output increase to match numbers of workers. These dislocation factors are larger than the productivity you are trying to measure and make conclusions uncertain. Many low pay service jobs are labor intensive (clerks) and there is little change in their productivity. Does the shift of unemployment from high productivity higher pay manufacturing jobs (due to automation) mask the effect of automation if the workers are displaced to low productivity service jobs? Trade gets splashy headlines due to the large numbers of displaced at one time. Carrier was over 100 jobs in one whack. Automation often operates at a steady trickle that does not make big news, but over time can greatly outpace the dislocations due to trade. Automation is often used to replaced labor shortages, such as welding robots replacing welders. A worker can be trained to operate a welding robot for less than a welder can be trained. Thus, our welder can be replaced by a lower pay worker. Unless the robot is more productive, it will not increase output, but it does cause displacement and job loss. One of the main causes of inequality is the myth of globalization and the failure to properly account for intangible capital (IC). The myth is based on the failure to penalize the theft in offshoring which is the theft of public IC by a company that does offshoring. The IC includes the IC components which are Maslow’s public safety, worker skill and knowledge acquired from public education, and technology produced by public investments in national defense (the Internet …), federal R&D such as university and NIH research, domestic law enforcement, healthcare and infrastructure essential for commerce. The theft occurs when operations at a company with domestic jobs and factories are first established in America with IC created as a result of public investments and then moved offshore with transferred IC based on proven business capabilities consisting of knowledge, tools, technology and processes. Since 1992, IC has been a larger part of business investments as a part of GDP in America than tangible capital. About 85% of the value of many S&P 500 companies is IC. Theft of IC in offshoring creates a negative externality in economics that is similar to pollution of public resources penalized in environmental regulation. Trade imbalances don’t measure the flows of IC. Measuring the flows of IC created with public investments is a prerequisite for properly governing offshoring in globalization. The new international activity in Integrated Reporting is changing financial reporting in business to measure both tangible capital and IC. Regulations on offshoring should require repayment of the apportioned public investments that produced the IC used for manufacturing operations at a company with a tax of at least 35% on the value of traded goods sent back to America from offshored factories. Failure to measure the flows and theft of public IC explains at lot of inequality. For example, a large part of a patent (which is IC) is typically derived from public IC such as federal investments in R&D (NIH …) . Therefore, the excessive pricing of goods such as drugs protected by patents is another example of the theft of public IC. Pricing of patented goods derived from public IC should be regulated to account for the use of public IC as should offshoring be regulated. In accounting practice: R&D (which is a large part of IC) is capitalized when the R&D is produced externally but is an expense when it is produced internally and thus reduces taxable revenue. All R&D should be capitalized along with all IC. Reference for financial accounting of IC – Integrated Reporting. Automation is on the face of it ridiculous. What part of the world has gone farthest in automation? East Asia. 90% of the world’s robots are made in South Korea, Japan and China. What kind of employment to population ratios do these countries have? Among the highest in the world; much higher than the US, especially China where factories are begging for workers and wages are rising +8% a year in real terms. What about the parts of the world with no automation? How is employment in Sub-Saharan Africa? Typically 5-10% of the population has a formal sector job; so 90% in the gig economy. This is not a coincidence. The more industrialized and automated your economy, the HIGHER employment will be. That the automation story spreads so widely speaks to the narrow provincialism of most US economists. In the 1930s we ran into the same thing, and people said the same thing about just creating new jobs. Of course, this isn’t how the real world works. Left alone, higher productivity cuts the aggregate wage bill which decreases demand and so on in a vicious cycle of unemployment, falling prices and a shrinking economy. In the 1830s, it took a violent labor movement and intervention by the medieval monarch to raise living standards and grow the economy instead. In the 1930s, the US took its own interventionist approach. Unfortunately, the current ideology is anti-growth. Even on their own logic they should accept higher competition. Pretty hopeless state of affairs, when even critics of the Democrats’ and liberals’ weak response to globalization, people like Branko Milanovic, are still missing basic facts of economics and politics. First, branding opponents of globalization as either localists or nationalists is groundless. Ono could parody this by discussing the implicit critique of the localvore movement for food grown nearby, but I’m diluting my argument for a cheap laugh. Who is Brnako Milanovic to say that people rejecting goods made overseas because foreign labor is more plentiful, cheaper, labor rights and basic freedoms don’t exist in most countries, that opposition to globalization is morally deficient? I can assure you my opposition is not grounded in religious like fervor or tribal affinity. Neither am I nationalistic in the way he expresses with the extreme example of North Korea. His contention that those are the only two properties or foundation of any anti-global stance is wrong. Oddly, I can even use Krugman indirectly to support anti global economics. He critiqued the European economic union due to differentials in wages, living standards, and labor conditions, financial systems, etc, between north and south, and east and west (the east being former Soviet bloc). Globalization has run amok, and today it stands for low wage countries with inadequate freedoms robbing workers in developed nations of jobs to enrich the greedy elite everywhere. There is no trade balance with Germany or Japan. There is no trade balance with Mexico. There is no trade balance with Saudi Arabia. China is a special case because it is so big. But if you can’t figure out Germany, Japan, and Mexico, forget about China. The Saudis are not buying enough jet fighers and they don’t have a consumer led economy either. China also is determined to eliminate any comparative advantage the U.S. and the west currently enjoys. The remedies Milanovic proposes are a joke and are ignorant on their face, presuming it’s not a con job to sell a compassionate globalization. Addressing labor rights through trade agreements in low wage country will not work. Workers earn 1/4 or 1/2 of US wage levels. You could increase their real income 5% every year and it would take 20 years to achieve parity, assuming U.S. wages grew pathetically slow. No one thinks China will be at the level with the developed countries that fast. But if they were and engineered their economy like Germany and Japan, you’d have a bigger problem. Why would China agree to change their economic system, labor structure, political liberties now to help workers in the rust belt? They’ve already proven their system works. They would rebel against being dictated to by foreign powers. Try at least figuring out Mexico first. That should be an order of magnitude easier. Likewise, Japan and Germany. Milanovic ignores the basics of current international trade which does not work like rules in an economics textbook. This makes Trump and his non college often somewhat racist supporters smarter than him. Milanovic also supposes equal opportunity to education is the other half to equalizing loss to globalization. This ignores the current glut of college graduates. The idiots looking at unemployment rates for college vs. high school fail to realize if everyone had a college degree, it wouldn’t magically create that many jobs or possibly nearly any jobs that require those skills. In the long run a better educated workforce would help. But the argument that structural imbalance under-educated workforce as a cause for inequality or globalization losers is one supported by conservatives Greg Mankiw and bears little relation to reality. When the supposed liberal voice is supporting Mankiw, it’s their own fault for not being smart theory, you know you’re in trouble. Sad to think this blog believes Milanovic makes any sense. He gets right that economics leads to Trump. Nearly everything else he espouses it wrong and insulting. I don’t need a moral lecture that opposing globalization is evil. The problems facing the US economy are structural, but they are not fully visible in the short run…like the fact that the low unemployment rate is largely due to demography (people leaving the labour force), and the increase in part-time and low-income jobs. Mounting debt by low-income households will become a serious problem as interest rates rise. The big puzzle is this: what would be the best approach to reverse the economic mess that the US is facing? While this would work in the long run, the adoption of such policies in the US (and Canada for that matter) is not likely. This is a truly awful agenda. R&D should be increased by the government, and freely shared. Otherwise the privatization of technology which results in rents and impeded progress will expand. Reverse the idiotic first-to-file patent law change the upended over 200 years of IP law where first-to-invent was the rule, and inventors had some rights over corporations. Thank you Obama and Democrats for stripping away those rights and removing the incentive to share new discoveries and helping destroy academic research. Whether a corporation decides to relocate can’t be dependent on whether the business can squeeze more pennies by retaining operations here. The U.S. can stop companies from closing factories or moving factories by passing a law that says companies can’t close factories. The can also do this with tariffs, taxes, and less directly with worker councils, public shaming, boycotts organized by non-union entities, eminent domain. What will not work is giving them a choice to relocate or cut costs at home. U.S. management is not good about making choices that benefit workers. The time is long past to be giving them a choice. Fighting free trade abuse vs globalization is not an option anymore. China is too big and powerful to fight. They will not be pushed around. No one is going to dictate to China how to run their country or conduct trade. They will forgo trade with the U.S. eventually rather than change their system. You can’t even get fair trade with Japan, Germany, and Mexico. Face it, globalization is bad for the American worker, period. The less of it, the better. Limiting higher education or targeting and strictly tracking people into vocational training is wrong and unAmerican. More opportunities should include apprenticeships, not so as to turn into corporate welfare that pays substandard wages to the detriment of workers. Also, there is no shortage of STEM graduates, although there is a shortage of medical schools, which only cost $100 million each (drop in the bucket). Finally, “mandatory apprenticeship” is nearly Brave New World like in approach, giving alternative training a bad name. As robots do more, education and manual crafts can take the place of job training. We’ll have more time and money for school, not less. Corporate governance changes which rely on shareholders is hardly beneficial to workers. Most shareholders are rich. Copy post-war Germany and give workers a greater say instead. I seem to recall that the Roman Empire had a problem with agricultural workers leaving the land. Sometimes it was to find employment in town, sometimes it was to go work on another plantation that allowed their farmers to keep more of the produce they grew. Anyway, the big plantation owners were having problems keeping their workers, and the government was having problems collecting their taxes, so they passed laws forbidding people from leaving their place of employment. They also had a problem with inflation, so they passed laws fixing prices, while at the same time they increased the money supply by “debasing” their currency, making more coins from the same amount of the index metal. These policies did not work out well.